Create animations in 1 minute with WebAnimator GO! WebAnimator GO is an essential step-by- step toolkit for newbies and casual users wanting to instantly start creating animations, product presentations and slideshows. A step-by- step HTML5 animation toolkit for beginners to instantly start creating gifs and animations on websites, online stores and social networks. Struggling for a smart way to keep your online content more interesting to your audience and customers? Start creating with WebAnimator Go, the essential 3-step animation toolkit for newbies and casual users wanting to make stunning animation with HTML5. With an amazing collection of ready-to- use presets, GO will help you save time and effort, so that you can create amazing gifs, banner, product presentations and slideshows for your website and online personal projects in seconds. By using built-in interactive effects, you’ll bring content to life with no need to code or have design skills. Text transitions, sliders and floating images are just a few tools to spice up your content. Like any other member of the WebAnimator family, GO is a powerful do-it- yourself software. Besides, with your creations safely stored on your computer, you can always go back to your work whenever you want. So take the stress out of your online projects and unleash your potential to get fully noticed by the people you love. All the content you create is equally beautiful on every device, from desktop computers to iPhone® and iPad® or smartphones and tablets. WebAnimator GO animations and interactive objects look brilliant on every modern browsers. Thank you, Nick; that obviously is a deal-killer nowadays! Graphics and animations are an important part of websites, they are what catches the attention of the visitors. Designing web animations is not an easy task, and takes practice, skill, and time. But there are a few third party applications that can help you achieve quick, convenient results without much effort and time. 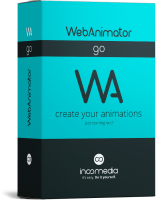 WebAnimator GO is an easy to use application, that allows you to create web animations in three easy and quick steps. You start by choosing a template, make changes to it by inserting your content, and export it to be used where you want. The installer size is ~13MB and the installation process is simple and straightforward, taking no time at all to complete. After launching the application, you need to register it using the license information that you have and you email address. Once you recieve the verification email, and confirm by clicking the link, the application is activated and ready for use. The UI of the application is clean, simple, and easy to navigate through. On the left-side you have four options, namely Project Selection, Choose Template, Enter Content, and Export. First you decide whether you want to create a new project or work on an existing one, and click the ‘Start’ button on top right. In the next step you can choose a template from those available. There are many templates like slideshow, products presentation, zoom rotate, moving background, transition & text, and more. Next, you can add your images to the template. In the last step, you can export to Gif, or to WebAnimator Standard, or to file compatible with WebSite X5 site builder. – Easy to use, wizard like UI that guides you through the process. – Contains 4 standard templates alongwith Template Collection 1. – Allows you to import and add images of any format. – Custom color overlays and texts. – Export projects as HTML5 code, GIF, WebAnimator Project, or to Website X5. – Ability to change the default browser for preview. 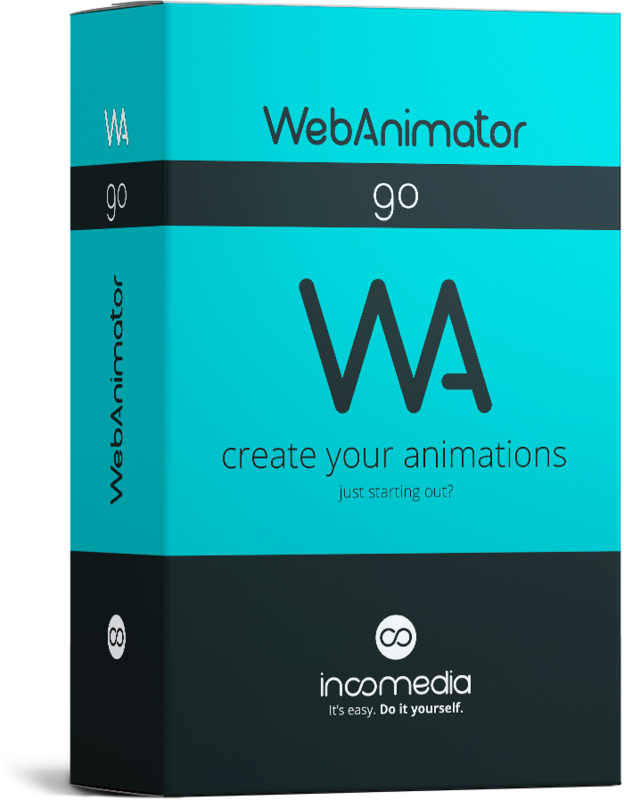 WebAnimator GO is a reliable and useful application, that can help you generate web animations quickly, easily, and efficiently. The application runs smoothly, without any lag or crashes. System resource usage is low to moderate. It is definitely worth trying.